President Trump proclaimed October 9, 2017 as Columbus Day and he made no mention of Native Americans. Being more sensitive to the plight of the indigenous American than the President, multiple cities and counties have replaced Columbus Day with “Indigenous Peoples’ Day,” including Los Angeles. 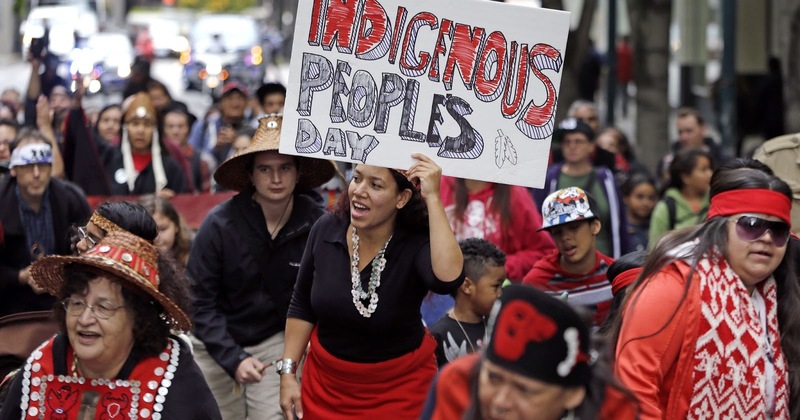 Christopher Columbus’ accidental discovery of the Americas in 1492 sparked one of the greatest genocides in human history: The indigenous peoples of the Americas experienced massacres, torture, systematic oppression, and forced relocation. Some scholars believe that 75-100 million indigenous peoples were killed through the centuries by Europeans and their descendants. Is Columbus to blame? Perhaps he is because he did report to Queen Isabella of Spain that the natives “ought to make good slaves.” And that is precisely what happened to the survivors of the conquest. In addition to its historical significance as the year in which an explorers folly launched mass genocide,1492 also marked the year that the Spanish totalitarian, anti-Semitic regime murdered and expelled hundreds of thousands of Sephardic Jews. Ironically, some scholars have recently concluded that Columbus was in fact, Jewish. Among other evidence, his personal letters and diary entries were written in Castilian Spanish or Ladino—a Jewish version of the Spanish language. Some speculate that Columbus was probably trying to save his own people by becoming an explorer yet he never expected that his adventures would lead to the inception of a super holocaust. Large numbers of Jews and their descendants, faced with forcibly converted during the Spanish Inquisition and came to the New World instead of fleeing North or East. Latin America attracted considerable numbers of New Christians because these territories or Spanish colonies offered a familiar culture and the possibility of direct contact with the mother country. Some communities had crypto-Jews, who concealed their identity from the authorities but continued their practices in secret. However, the Inquisition made it to the colonies and practically obliterated the record of the colonists’ Jewish origin. Today, Mexico and Central America are predominantly of mixed Spanish and indigenous descent—mestizo or ladino. The Ladino people are a mix of mestizo in Latin America, principally in Central America. The word is derived from the Spanish word “Latino” and refers to those Spanish-speakers who were neither colonial elites nor indigenous. The Central American word for mestizo just happens to be the language for the Sephardic Jews as well. Unbeknownst to many Catholic mestizos, they have Sephardic roots and may be eligible for Spanish nationality. After hundreds of years, on October 1, 2015, the Spanish government enacted a law that confers Spanish nationality to the descendants of Sephardic Jews, publishing a list of over 5000 surnames which might indicate a person has Sephardic Jewish ancestry. When the Sephardic Jews left Spain, they had to change their religion and names. They assumed names of towns, animals, and words related to Catholic religion. The list of names is very comprehensive and includes many of the most common surnames in Latin America like Sánchez, García, Ramírez, Jiménez and Mendoza. Most of the migrants from Mexico and Central America have the surnames found on this list. For Latino Heritage Month, we celebrate the achievements of immigrants and cultural diversity. We do not celebrate the shameful history of Spain as it pertains to mass human rights violations. Instead, we honor the contributions of the wonderful mixed, American mestizo culture. This was not exactly the case with President Donald Trump when he referenced the recovery efforts in Puerto Rico and the hundreds of thousands of “Hispanics” in the military, for “Hispanic Heritage Month.” Should we be celebrating Hispanics in the military or Latinos in the military? Trump has rescinded DACA that benefits mainly Latino dreamers. He has insulted the people of Puerto Rico as they struggle to recover from Hurricane Maria, and he has pushed for harsh reforms to the Immigration and Nationality Act that would make it more difficult to immigrate and seek asylum from violence in the U.S. Even though it took centuries, apparently Spain has recognized the shameful injustice of what was done to the Sephardic Jews. As way to atone for the historic persecution of Spain’s Jewry at the hand of religious officials of the time, the contemporary government in Spain has offered to confer Spanish nationality upon their Latino descendants. Hopefully the U.S. Congress and a new President will properly honor the contributions of Latinos and grant reasonable, immigration reform that benefits Latinos, many of whom may very-well-be descendants of Sephardic Jews.